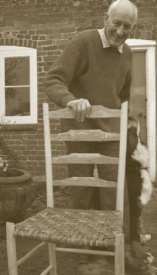 The first chair, made at Mike Abbott’s woodland in Herefordshire, has cleft Ash legs and rungs that have been shaped with a drawknife on a shaving horse. The ladderback rungs are made of cleft Oak, and show off the medullary rays to great effect. Most fascinating and attractive was the seat that was made of the inner bark of Wych Elm. This had been removed from the tree in spring, when the sap was rising. The bark was then cut in to strips before weaving it into a seat – an idea gleaned from traditional North American chair making where Hickory bark is used for similar purposes. The seat of the second chair is made from a thick piece of Elm from Anglesey, and the other parts from his own farm-grown Ash. Steam bending was necessary in making some parts for both chairs. The structural parts are made of Ash, with attractive spokes of Hazel. For his daughter’s bedroom Bill was determined to craft a “natural” bed to feature the timbers grown in his own woodlands. This is the sensational result. In 1993 Bill converted an 11 acre arable field to a silvo-arable agroforestry system. Single lines of trees were planted at an average of 1.5 metres (5’) between trees in the rows and cropping alleys 12 m (36’) wide were created to suit his harvesting machinery. The tree lines run north/south to minimise shading of the arable crops. Five main tree species were included for longterm timber production:Wild Cherry, Oak, Sycamore, Ash and Black Walnut.These were separated by 6 m (19’) intervals in the rows. First to crop will be the Ash and Cherry.